The St. Regis Bali is a five star hotel in Bali, is one of the luxury hotels in Bali. 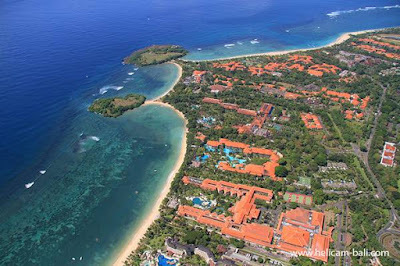 This five star hotel is located in the complex of regional hospitality BTDC (Bali Tourism Development Corporation has now become the ITDC (Indonesia Tourism Development Corporation)), Lot S6, PO Box 44 Nusa Dua, Badung regency, Bali, with the postal code 80363. Located about 40 kilometers from Denpasar. Distance from Ngurah Rai Airport is 9.40 km, with a travel time of less than 30 minutes. The St. Regis Bali is owned by Starwood Hotels & Resorts Worldwide in collaboration with the Rajawali Property Group. 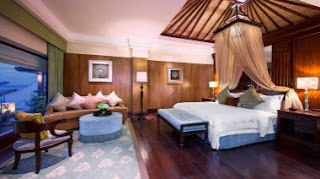 This luxury hotel has several types of rooms with different prices, the St. Regis Suites (Rp. 5.300.000 to Rp. 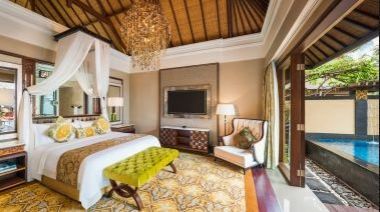 5.900.000 per night, villa Rp 13.000.000, Grande Astor Presidential Suite Rp 36.000.000, The Strand Residence Rp 73.000.000. 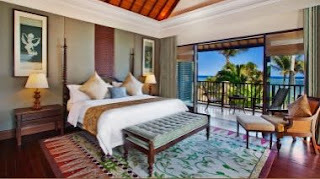 The St. Regis Bali Resort really deserves to be called as a five-star luxury hotel in Bali. 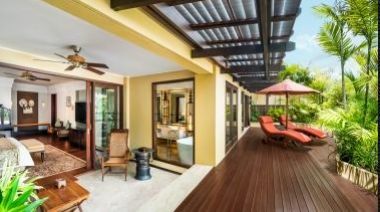 This five star hotel has several room types namely Standard Suite, Villa Garden View, Gardenia Villa, Villa Standard Villa Two Bedrooms. The resort is to rely on some of the most desirable dining experience and has won awards in the island. Like the other five star hotels in Bali, The St. Regis Bali has plenty of room options for places to stay with your loved one or with family. This room can be occupied by two people with a choice of bed, King Bed and Double Beds. This room can be occupied by two people with a choice of bed, King Bed. 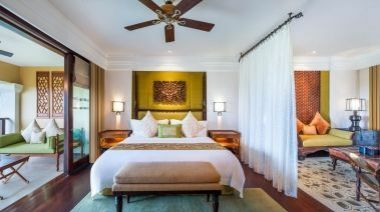 This room can be occupied by four people, or two adults with two children, with a choice of beds, King + 2 Single Beds. This room can be occupied by two adults but is not suitable for children with choice of bed, King Bed. This room can be occupied by four adults but no children, or two adults with two children, with a choice of beds, 1 King + 2 Double Beds. This room can be occupied by two adults with choice of bed, King Bed. This room is the most widespread, may be occupied by six persons, or three adults with three children, with a choice of beds, three King Beds. 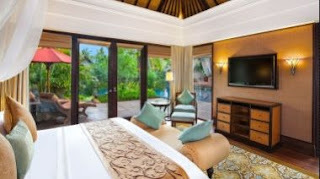 Five Star hotels in Bali are very luxurious and ideal for fun and relaxation, The St. Regis Bali Resort is located on Bali's Nusa Dua area which is an area of the venue of various important meeting and internationally. Only 36 km from the city center, this strategic location of the hotel ensures that guests can quickly and easily reach all places of interest in Bali. As a place of rest and relaxation, the hotel is located just steps from a variety of attractions in this city, like Bali National Golf Club, Mengiat Beach, At the Corner, WaterBlow, and more. Exuding elegance beachfront, The St. Regis Bali Resort is a spectacular destination that offers incredible wealth and luxury for tourists classy award winning most intelligent in the world. 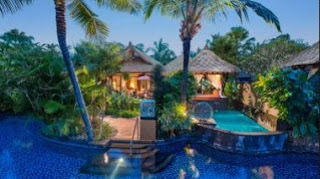 Home to the only series of private villas with direct access to the best white sand beaches in Nusa Dua, the resort consists of a suite and villa offers stunning premier accommodation, service according to the needs of the world-famous, a typical 24-hour Butler Service St. Regis and very special gastronomic experience and have a taste. 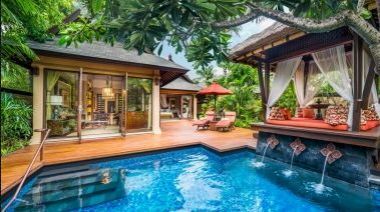 This has made the St. Regis Bali Resort is recognized once again in the list of the prestigious Condé Nast Traveler Gold List 2016 as one of the favorite resort in the World and Best Resorts for Families in the Condé Nast Johansens Awards for Excellence 2016. 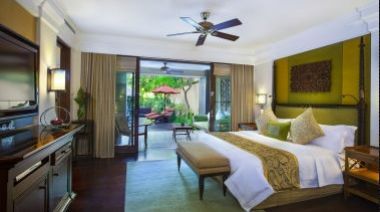 You definitely captivated by the nuances Balinese life that is elegant and understated here, The best place in Bali. 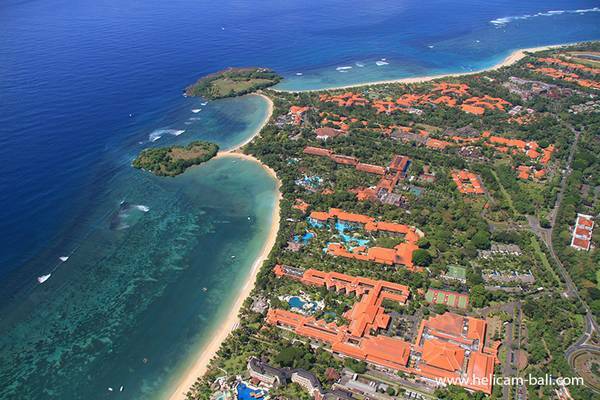 Five Star Hotel in Bali is very pleasant, because the atmosphere in the hotel area is very convenient. Although the hot air out of the room, but on the beach you can get a shaded area, since the pool / water atmosphere and leafy trees are everywhere. Breakfast was excellent also service in the restaurant. Upon check-out does not need to queue. All services and amenities that guests expect from Starwood Hotels & Resorts Worldwide is very comfortable, like at home. The hotel offers access to a number of services, including 24-hour room service, free WiFi in all rooms, 24-hour guard, chapel, shrine. Accommodations at The St. Regis Bali Resort has been carefully for the sake of maximum comfort with a flat-screen television, internet access (WiFi), private pool, whirlpool in some rooms. The hotel offers fantastic facilities, including rental of water sports equipment, yoga room, hot tub, private beach, fitness center, to help guests relax after a busy day in the city. 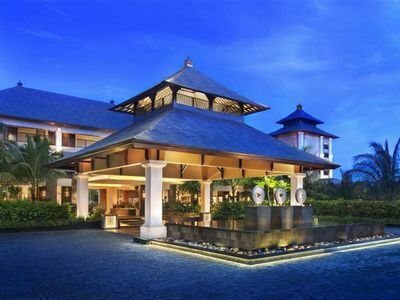 The St. Regis Bali Resort has excellent meeting facilities. From the extraordinary meeting to meeting packages that can be customized, the best place in Bali this is an impressive location to hold meetings and various events. The total space of 10 688 square feet, 4 meeting rooms, 123 suites and villas, free Wi-Fi access, a place for dinner beachfront private groups, professional on-site event specialists. 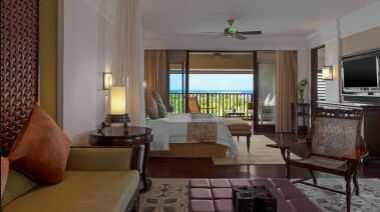 The resort is to rely on some of the most desirable dining experience and has won awards in the island. Has several restaurants with the best dishes, Restaurant of Kayuputi, Dolls, Dulang, Gourmand Deli, King Cole Bar, Vista Bar.